If you are a parent of a child from a hard place, you should know your child could be acting out of fear from things they are not even aware they are remembering. So being able to bring awareness to our children and giving them voice are the keys for integrating memory. You can help your child bring their implicit memory into awareness and integrate their memory by empowering and encouraging them to use their voice. One way for your child to use their voice is through telling their story. Elise and I had a traumatic experience during the summer of 2012. We were swimming at a friend’s house. Elise was with her little friend playing on the steps when she decided to reach for her kickboard, and she couldn’t quite get a handle on it before she fell off. My friend jumped in the pool at the same time I ran over to the edge of the pool and pulled Elise out. (That image of Elise right before I pulled her out is burned in my mind.) After she was out, I asked if she was okay, hugged her tight, and I told her that it scared me. She hugged me back, bit me on the shoulder (a fear response), and got back in the pool with her friend. During the car ride home, Elise said, “Mom, I thought I was going to sink to the bottom and not see you again,” which was accompanied by many tears. I just kept telling her that I was so glad I was there to help her. She was very tearful that evening, and her dad and I just loved on her, reassured her, and assumed she was mostly tired from an eventful day. The next day Elise didn’t bring up the pool incident. We went to the library, checked out several books, and came home for rest time. During rest time, Elise had been reading her new library books. When I went into her room, she immediately started saying, “Mom, mom, in the bear book something happens and he’s stuck in the water!” I could tell by the tone of her voice that she was really worried about this story. She was flipping hurriedly through the pages to show me where the daddy bear fell out of the boat and the baby bear pulled him out. I don’t remember how I started the conversation. I may have said something like, “Oh he fell in the water like you did yesterday.” And then Elise just started her story, “Yes, I reached for the kickboard and then I sank the first time. I held my breath and sank again. Then you came and pulled me out. I thought I was going to sink to the bottom.” I asked her if she was scared. She said yes, and I told her I was scared too. And that I was so thankful I was there to help her. We talked some more about swimming and being safe, and then she moved on and asked me to read her chicken book from the library. A more natural response for me would have been to assure Elise that the bear was fine and show her the rest of the book—to put the past behind us, and I would have missed completely what was going on. And Elise would still be scared. 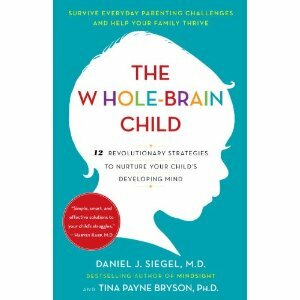 I credit The Whole-Brain Child with helping me understand what to look for in my child and teaching me strategies to connect with my child and help her make sense of her world. I also credit The Whole-Brain Child with giving me strategies to help myself cope with that traumatic experience. I pray that you and your child are never as scared as Elise and I were that day. But if you are, replay the story as often as they need it. It will help.